Our community shares in the responsibility of developing and nurturing our children’s Jewish identities. At our Religious School, experienced and dedicated teachers share their knowledge of and passion for Judaism with our children. Our small classes offer students the opportunity for individualized instruction and personal attention. Students of all ages come together for holiday observances and celebrations. Confirmation students engage in a seminar-style year of study with Rabbi Sherman, focusing on contemporary Jewish issues and concerns. Parents are involved with the school and participate in many of our programs. Our school offers a place to grow, ask questions, and seek answers as part of a Jewish learning community. Our Religious School curriculum integrates Judaica and Hebrew with active programming in an informal atmosphere. At the end of each class session, the entire school community gathers for a short service, which helps to facilitate students’ familiarity and comfort with prayer and with Hebrew and fosters their sense of community. We pray, sing, and explore the prayers in fun and relevant ways. Students learn the English meanings of the prayers, and they gain an understanding of the history behind the prayers as well as the physical choreography used during the service. Then students meet with their teachers for Judaica and Hebrew study. Cooking, music, and the arts are integral parts of the curriculum for all grades! Younger elementary school students study Jewish time, experiencing the holidays in age-appropriate ways. They also learn Jewish values such as kindness and compassion, and they learn how to be a mensch and do the right thing. Students in all grades study Hebrew letters, prayers, and basic vocabulary related to the holidays. 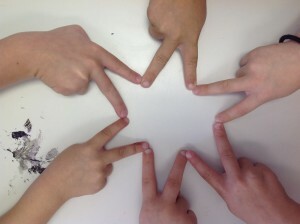 Our teachers encourage questions and conversation, and they always find ways to make Jewish learning fun and exciting! Our middle school students study Jewish values by exploring ancient and contemporary texts. Students continue their study of the prayers used in our worship service. Most of our students also prepare during this time for bar/bat mitzvah. Our 10th and 11th graders participate in Confirmation class. Students study all year with Rabbi Sherman, exploring what it means to be a Jewish adult and make Jewish choices. Students lead the service and share their own Jewish journeys at a special Shavuot service in May. Confirmation students also participate in TYGER, our youth group for high school students. Please download the Religious School Registration Form and School Calendar.